Go Crazy With Us! 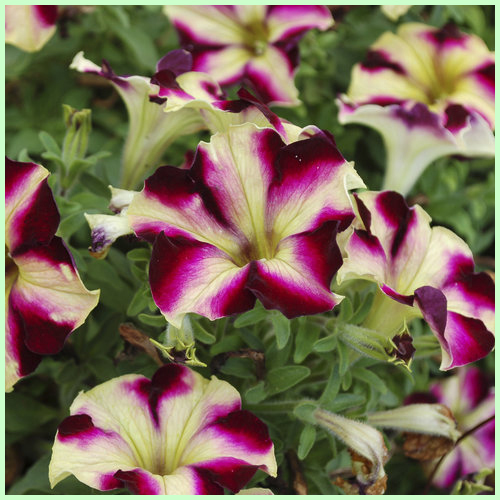 | Faddegon's Nursery, Inc.
May 5, 2016 | Annuals, What's New? We’re going crazy for these new petunias! The patterns and colors on Crazytunias are so much fun! Mounding and slightly trailing, Crazytunias are great in containers and in the landscape. The expected height is 9-12″ with no deadheading needed. Very easy care with so much impact! Now you can get crazy! Cherry Cheesecake Yes, Please! This looks as lucious as it sounds! I would combine Cherry Cheesecake with Sweet Caroline sweet potato vine. Pulse I can feel mine! My heart races when I see this flower! Yellow, pink and magenta make one happy looking flower. No combination necessary. I would plant this one on its own! Mandeville Fiery red with brilliant yellow stripes, Mandeville, stands out! For bold, can’t be ignored annual flowers, turn to Crazytunias!